Last night I had a delicious fondue dinner with Matt and Michele (my brother and sister-in-law) in honor of St. Nicholas Day, which is celebrated in Switzerland on December 6. Michele’s family is Swiss, and I lucked out in getting to partake of this year’s festivities. 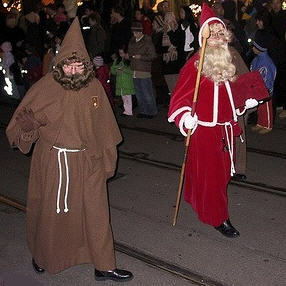 Contrary to what I thought before I knew any better, in Switzerland, St. Nicholas Day is different than Christmas. On St. Nicholas Eve, children in Switzerland leave out a boot, and hopefully wake up on Dec. 6 to find it filled with chocolates, nuts and oranges. St. Nicholas – or Samichlaus – is accompanied on his journeys by a dark and scary friend Schmutzli and a donkey. Rumor has it that the bad kids get coal and a beating from Schmutzli’s switch. Lucky for me, I got a Lindt chocolate snowman instead. Happy St. Nicholas Day!